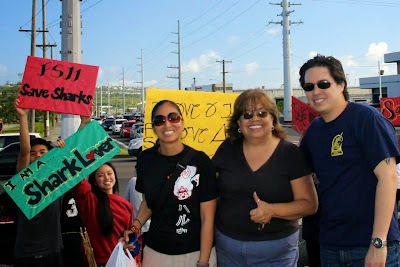 Melanie Blas (center) with the Shark Defenders and her students from Simon Sanchez High School at an event to raise awareness for shark conservation. Today, Melanie Blas, a science teacher at the Simon A. Sanchez High School in Guam, received the U.S. Environmental Protection Agency’s Presidential Innovation Award for Environmental Education (PIAEE) for her contribution to environmental protection. In a ceremony at the White House, teachers and students from across the nation, including San Diego, Turlock and Guam were honored for their work to promote environmental education and stewardship. Projects in Blas’ classrooms include having a classroom garden, planting native trees with various state and local agencies while learning about erosion and protecting the coral reefs, teaching younger elementary school students about protecting the environment, and writing to their local senators and representatives about ongoing local issues. The 17 teachers and 60 students awarded nationwide, demonstrate the creativity, innovation, leadership and passion for community engagement needed to face difficult environmental challenges. Teachers and students attending the ceremony will also be participating in a workshop led by the White House Office of Science and Technology Policy to discuss climate and best practices in the field of climate education.